NOTE: To see the thread showing the process in which this sword was made, it can be viewed here. Also, the best place to get pictures of the sword would be from the aforementioned thread, because his pictures are clearer and cleaner than anything I could muster with an amazingly terrible old cell-phone camera. In fact the uploaded image of the finished product is one of his images that was cropped down and resized enough that I could upload it. Why it was commissioned . . . The whole reason this project happened is because, for the kind of sword I wanted, I was having such a hard time finding anyone out there offering blade lengths under 30" in the right style that I was after. I eventually found Albion's blade blanks, with the perfect fit for the blade, but Albion won't take commissions to finish their own blade blanks (mildly annoying for someone like me without the facilities to finish my own blade . . . but understandable given their purpose as "project blades"). However, as luck would have it, Alan had very recently made himself known here as a business (as Paladin Forge) being able to do the exact kind of work I'd need (and his other works looked promising). I'm really happy that Alan was willing to work with me, sketch out some concepts, and make the sword that I really and truly wanted. As mentioned already, I was looking for a double-edged sword with a blade length under 30". I wanted a slightly longer grip than average, so I could easily use the sword either two-handed and/or with plated gauntlets and have no problems. I also wanted a sword -with scabbard- that was practical, functional, rugged, and aesthetically pleasing with a simple elegance. First off, I don't really believe there are any other reviews of Alan Schiff's work via Paladin Forge, at this time, so I'll just say that it was an absolute pleasure doing business with him. I never waited more than 24hrs for a reply to any question or general communication. We were able to have an excellent back-and-forth dialogue over the requirements, expectations, and wishes for the project. He took the time to answer every and any question I had along the way, and was quick to address any concerns I had as the sword developed. Also, the price was exceptionally reasonable for the work involved, which made it a great way to get some custom work done for the sword in question. Not to mention, the logistical side of the whole process was completely painless. Billing was prompt, accurate, thoroughly explained, and 100% matching of the initial quote. Shipping was quick and efficient, and the sword was very well packed in many layers of bubble-wrap, plenty of extra packing-paper padding, and sealed in a heavy corrugated cardboard box. I received the sword and have spent the last several days taking some time to hande the weapon and get a feel for its performance. Needless to say I'm thoroughly impressed. If the opportunity presents itself, I would absolutely have Alan do more custom work for me in the future. One of the things I wanted was a bit longer grip for two main reasons: 1. I did want the point of balance closer to the guard for handling the lighter and shorter than average blade -besides the fact that riding swords are meant to be versatile- and 2. I wanted it to feel comfortable with plenty of space to grip, even with full plate gauntlets. Thusly, Alan had recommended using a recessed nut for attaching the pommel and eking out the desired extra length. This was something I honestly hadn't heard about before. All I really knew of was peened tangs or threaded pommels. As Alan even described it to me (attachment 1: his drawing with the description), the tang is threaded, but the pommel is not. Instead, the nut is recessed into the pommel and extends the tang's length by a bit without any sort of weld. Not only does it feel extremely (and honestly surprisingly) solid in the build, just as solid as a peened tang, but it makes it nice and convenient any time I would wish to dismantle the sword for thorough cleaning/polishing/oiling. The grip and scabbard are both made with a wood core and leather wrapped. The grip also has a nice wire-wrapped texturing that, while a subtle and pleasant aesthetic, provides a nice feel and extra comfort when not wearing gauntlets or gloves. While the scabbard may not have a locket or chape (planned to-be-added later when Alan gets his lockets and chapes where he likes them), the blade still sits quite firmly and snugly into the scabbard. The only time the blade comes loose from the scabbard (with no effort) is when flipped about five-to-ten degrees from perpendicular with the ground. Considering I don't plan on doing any summersaults or back-flips with the sword any time soon, I'd say that's a pretty solid and snug fit. The leather at the tip of the scabbard is tightly crimped and has little-to-no chance of being pulled loose or getting worn ragged (again, once Alan has his lockets and chapes where he likes them, I plan on having them added to the sword). The main leatherwork for both the grip and scabbard have a consistent and even dark red dye replicated and hand-mixed from a color pallete of "Antique Oxblood" that I found for antique furniture leather restorations. I'm impressed Alan was able to nail the color so well. Now, while there is no stitching anywhere on the scabbard or grip, the glue is unrelenting and the seams are tightly pulled together . . . so I don't see it being a problem unless I somehow were to put the sword somewhere it's going to be way over 200 degrees Fahrenheit and possibly put the glue itself in jeopardy. The built-in hangers for the scabbard are also respectable and well-fitted to it with peened rivets. Subtle grooves on the scabbard body (that appear/feel to be built-up/walled with some wire/cord wrapping around the wood and under the leather) ensure that the hangers don't shift freely. When hung from a belt it sits at a nice 45 degree angle. This provides for smooth drawing/sheathing, as well as removes any worry of banging the sword/scabbard against the ground (I'm only 5'3", so it is a concern for me, and another reason I didn't want a longer blade). As far as the metal on the sword goes, everything is top notch. According to the Albion Customer Service Representative, when properly finished, the heat-treated blade blank should be comparable to anything from their "Next Generation" line of swords. I would certainly say that Alan accomplished this. On top of that, all of the other metal hardware on the sword is solid, well polished, mild steel of a respectably high quality. I fully expect this sword to last a lifetime, as long as I take good care of it and don't encounter any accidents or intentionally destructive/abusive use. While I haven't been able to put the sword through too many paces in the short time I've owned it, I've still been able to do a fair amount, and I'm pleased to say I'm thoroughly impressed with the results. It's a simple and practical sword that's able to fulfill it's intended role exceedingly well. First things first . . . the blade edge and point are both sharp and dangerous. It might not be scalpel sharp, but for it's intended role, it doesn't need to be; and it still gets the job done quite nicely. This is certainly meant to be a true and functional weapon . . . not a wall-hanger. While I'm not currently able to put full force behind anything, it wasn't really needed. I was still able to cleanly slice and puncture water filled bottles with no problem, all with simple arm motions and no real torso movement. The extended grip has a wonderful feel in the hand(s) with or without plate gauntlets, or gloves of any sort. The extra-close point of balance provides a quick and nimble feel to the blade; and it makes hitting the Center of Percussion (about 2/3 up the blade) on this relatively shorter blade extremely easy to do. Being able to easily hit this sweet spot also made for some really fluid and regular "draw cuts" during testing. The blade, being as light and as small as it is, is relatively easy to control the momentum of, even at higher velocities. The extra grip length also makes it easy to use two hands with, which made for flawless weapon-control and maneuvering; and provides the option of adding plenty of extra force behind the blade if I wished to do so. This weapon, built around the Albion Swords blade blank and finished with custom hardware/fittings by Alan Schiff of Paladin Forge, is a wonderful piece that I will treasure dearly. It's a pleasure to wield in it's highly versatile and functional build, while at the same time being aesthetically pleasing with it's practical and simple construction. Again, Paladin Forge (website located here) was an absolute pleasure to work with and I look forward to doing business with Alan in the future. I would highly recommend him to anyone looking to get some respectable and high-quality custom work done, at a reasonable price. 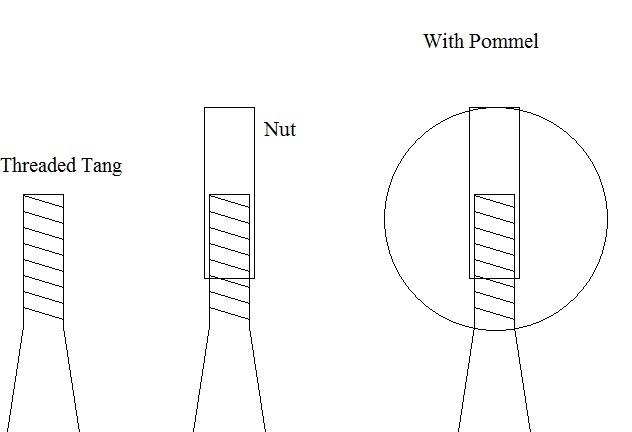 Recessed Nut Diagram, for anyone like me who had never heard of this before. Thanks for the review, Ben! I'm glad you like the sword so much. I wish my pictures were better, though. It gets so sunny here sometimes that the glare messes with my camera.